Thousands marched through Berlin on Sunday, January 13, to commemorate the hundredth anniversary of the brutal murders of the Marxist leaders Rosa Luxemburg and Karl Liebknecht. Communists and left activists from all corners of Germany and many foreign countries laid red flowers at the gravesides of Luxemburg, Liebknecht and other revolutionaries buried in the Friedrichsfelde Socialist Cemetery in western Berlin. The German Marxist leaders were murdered in January 1919 during the crushing of the Spartacist revolt by the “Freikorps,” a far-right group of demobilized German soldiers who had refused to obey the orders of Social Democrat Party leaders Friedrich Ebert and Gustav Noske to surrender their weapons following the German surrender in World War I. One hundred years later, marchers sang the Internationale and chanted slogans from the myriad socialist groups that came together to honor the martyred revolutionaries. The marchers called for solidarity with the struggle of the Palestinian people against the Israeli occupation; the Kurdish people oppressed by Turkey’s Erdogan regime; the workers struggling against repressive governments in Sudan and Iran; and for an end to neo-liberalism and imperialist warmongering in the European Union and NATO. 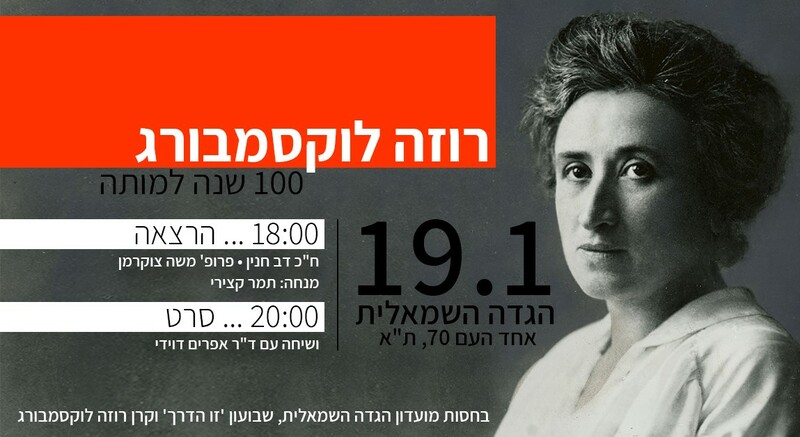 This coming Saturday evening, January 19, a symposium on the life and work of Rosa Luxemburg will be held in Tel Aviv under the auspices of Hagada Hasmalit (The Left Bank) Alternative Cultural Center, Zo Haderech Communist weekly and the Israeli office of the Rosa Luxemburg Stiftung. The event will begin at 18:00 at 70 Ahad Ha’am Street, and will include lectures by MK Dov Khenin (Hadash – Joint List) and Professor Moshe Zuckermann and a film on the life of Rosa Luxemburg introduced by Dr. Efraim Davidi. Tamar Katziri will be the moderator of the event.